Electric heaters are electric powered appliances designed for heating. This includes a huge range of heating systems: from the small and portable, to the large and heavy duty. Under the electric heaters umbrella you’ll find everything from plug-in panel heaters to traditional storage heaters, from outdoor patio heaters to slimline infrared panels. Which electric heater is best for me? The electric heater that’s best for you will depend on multiple factors, from the size of the space you wish to heat, to the frequency with which you use that space. There are various types of electric heater, each using slightly different technology and excelling in different situations. The majority of us are used to gas central heating, a rigid and inflexible heating system that doesn’t take into consideration different heating requirements or allow for individual room heating. Using an electric heater, or a combination of different electric heaters, provides flexible, portable, and efficient heating. Electric radiators are suitable for use throughout your home and are the most efficient replacement for central heating systems – featuring highly accurate digital thermostats, advanced programming, and energy-saving options. Panel heaters are a low budget heating option – equipped with basic controls, panel heaters provide fast-acting heat for occasional or supplementary use. Panel heaters are not intended to be used all day like their more sophisticated electric radiator counterparts. Electric towel rails provide additional bathroom heating and keep your towels dry and warm – available in classic ladder styles as well as designer glass ones. Patio heaters are designed to combat the fluctuating outdoor weather – from quartz heaters to ceramic, we have a range of outdoor heaters for domestic and commercial use. A portable electric heater is the perfect go-anywhere heating system, encompassing botch commercial and domestic products from fan heaters to under-table infrared heaters. Whether you need to heat a workshop or a home-office, there’s an electric heater for every occasion. From compact fan heaters to fully-fledged electric radiators, you’ll find everything you need here at Electric Radiators Direct. For more information about which electric heater is best suited to your needs, our sales team can provide friendly advice and are only ever a phone call away. What size electric heater do I need? The size of your room will dictate the amount of power required from any heating system to keep it comfortably warm. Once you know what kind of heating system you’re going to use, there are all sorts of tools out there to help you easily find the right sized appliances for the job. For instance, if you know you want an electric radiator, you can use our radiator calculator to quickly work out how many watts are required to keep your room at a comfortable temperature. If you’re not yet sure what kind of heating system you want to use, you won’t be able to use a calculator like the one above. That’s because different types of electric heater use power in different ways, so you may need more or less watts depending on what you choose. For instance, panel heaters are inherently less efficient than radiators, because they only heat by convection, with no supplementary radiated heat, so you’ll need a higher watt panel heater than you would a radiator to heat the same space. That means you can’t use the radiator calculator to help you find the right size panel heater, and the same goes for infrared panels, outdoor heaters and storage heaters. But don’t despair! All our products are clearly marked with a “heats up to” value, to show the maximum sized area they can heat comfortably. You can compare the maximum heats up to values of all our products in any of our categories – and if you click into an individual product, you can also find a minimum “heats up to” value, which can be helpful if you know your room is draughty, poorly insulated, high ceilinged, or otherwise difficult to heat. If you’re in any doubt, you can always give our expert sales team a call: they’ll give you all the advice you need to choose perfectly sized heaters for your space. Are electric heaters expensive to run? It’s a myth that all electric heaters are expensive to run. More so than any other type of heating system, the term electric heaters covers a wide range of models which employ different types of technology. Many people who have gas central heating are only familiar with the cheap portable electric heaters that are used as a temporary measure during building work or in the event of a boiler malfunction. Cheaply made, inefficient and expensive to run, these heaters have given electric heating a bad name – when in fact, there are many economical alternatives available. Some electric heaters are so efficient that they can even rival central heating as an affordable home heating system, despite the higher cost of electricity. 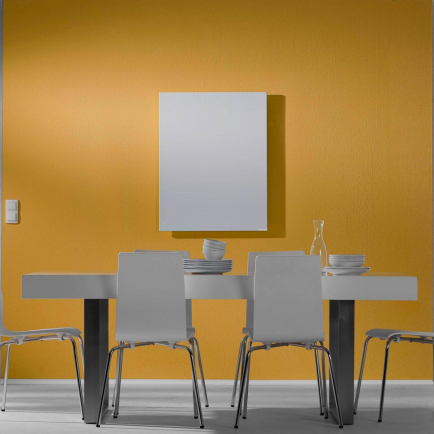 Infrared panels, for instance, are some of the most energy efficient electric heaters on the market. These panels heat purely through radiation, heating directly in the same way the sun warms the Earth, rather than heating up the air. People, objects and surfaces absorb and re-radiate this heat, so the room quickly becomes a 360° radiator, without losing heat through draughts. This makes infrared panels uniquely cheap to run. They can be used throughout the home as a stylish and economical heating system. Storage heaters are an old-school alternative to infrared panels that work in a totally different way but can still be very cheap to run. Storage heaters make use of economy tariffs by charging up overnight when electricity is cheaper and releasing heat throughout the day. They are less flexible and controllable than alternative heating systems, but if they suit your lifestyle, storage heaters can provide very cheap electric heating. Outdoors, electric patio heaters are arguably a luxury item, but if you are looking for a heat source for your back garden, you’ll find electric heaters are much cheaper to run than gas patio heaters – and they’re also safer, cleaner, and require less maintenance. Indoors, electric panel heaters are more expensive to run than electric radiators, but they are cheaper to purchase, so might work out the best choice for a room you use less often, such as a spare bedroom. Why are panel heaters cheaper than electric radiators? Many panel heaters look just like electric radiators but are available up to 50% cheaper. Why is this? Are they the same thing? When is it appropriate to choose a panel heater over an electric radiator? The critical difference between panel heaters and electric radiators is that panels heat purely through convection – whilst radiators supplement their convected heat with radiated heat. This makes radiators more efficient, because they don’t rely solely on heating the air. They use less power to heat the same size space because the radiated heat raises the core temperature of the objects and surfaces in the room, reducing the effect of draughts. Even if you lose all the hot air in the room through an opened door, the room will retain some heat so the radiator doesn’t have to work too hard to warm it up again. Electric radiators are more expensive because you get more for your money. They also cost more to manufacture, because they have to be carefully designed so that they have the right shape and are made from the best material to push heat out into the room. The housing of a panel heater, by contrast, requires very little engineering, because the heating elements are fairly simple hot metal strips fitted in the base of the heater. The superior efficiency of electric radiators makes them much cheaper to run than electric panel heaters. The most economical choice for your room will depend on how often it needs heating. In any room that you use regularly, the lower running costs of electric radiators will make them more economical over time. However, in a little used room such as a spare room, you may benefit overall by purchasing a cheaper but less efficient heating solution such as a panel heater. How do infrared heaters compare to electric radiators? Although infrared panel heaters look very different to electric radiators, they are actually fairly similar in application. Both offer an energy efficient electric heating solution that can be used throughout the home. 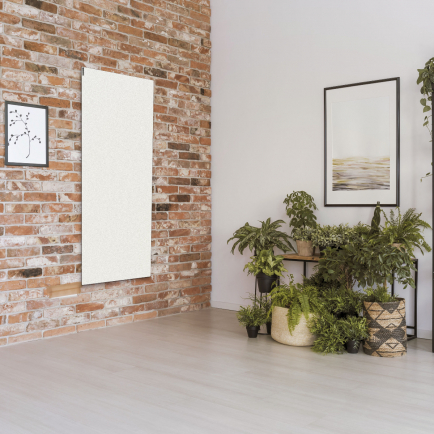 The crucial difference between radiators and infrared panels is that infrared panels heat purely through radiation – while radiators heat using a combination of radiant and convection heat. There are advantages to both heating solutions. Convection is a tried and tested method of heating homes, filling the room with warmed air to achieve cosy ambient temperatures. Radiators provide 60-75% of their heat in this way, and it’s a fast and effective way of raising the temperature. Because infrared panels distribute only a tiny amount of their heat through convection, an infrared system will take slightly longer to heat up. However, there are downsides to convection which radiators share. Convection is inherently a less efficient method of heating than radiation. Convection heaters warm the air which in turn heats you – whilst radiation cuts out the middleman by heating you directly. The extra heat transfer involved in convection brings with it greater scope for heat loss; heat can be lost through draughts and opened doors, or at any other occasion when hot air can escape from the room. Your radiators will start using more power whenever heat is lost in this way because the warm air has to be topped up. Infrared panels are much less vulnerable to heat loss in this fashion because they dedicate all their power to heating by radiation. Radiant heat is absorbed directly by people, objects and surfaces, so it isn’t lost with the movement of air. The objects that have absorbed this heat will then re-radiate it out into the room, creating a 360° radiator. The only situation where this is undesirable is in conservatories, where the glass walls are so thin that radiant heat will be absorbed and conducted outside, encouraging heat loss. The most efficient system for you will depend on how your room typically loses heat. If it’s draughty, infrared panels will be more efficient; if the walls are air-tight but thin, radiators may be a better choice. There are other factors to consider apart from heating efficiency. First, health. Apart from efficiency, one of the principal advantages of radiant heat is that it has no effect on the air. Convection heating naturally disturbs the air as warm currents rise and colder currents fall. These currents of air can disturb dust and move it about the room, which can be aggravating to allergy sufferers. Infrared panels avoid this problem, so might be the best choice if you suffer from allergies, asthma or hay fever. Secondly, there are the all-important style considerations. Infrared panels offer much more flexibility than radiators. They can be mounted on the wall or ceiling and come in a wide range of shapes, sizes and colours: from discreet white panels to tuck away on the ceiling, to handsome mirror panels that make a striking central feature. On the other hand, radiators are familiar items of household furniture which homeowners are used to incorporating into their interior design, so you may well prefer radiators as a more traditional heating solution. One of the main benefits of electric heating is the freedom to mix and match, so why not enjoy the best of both worlds? An electric radiator in the bedroom, infrared panels in your living room and a towel rail in the bathroom – we can help you find the perfect combination for your home. Are storage heaters still the most economical electric heating system? Over the last century, storage heaters have dominated the electric heating industry. In fact, for decades, if you had a home which was too remote for a gas supply, you would almost certainly be heating your home with storage heaters. However, today, things have changed. Heating manufacturers have used advances in digital and manufacturing technology to develop a suite of electric heating systems that are so efficient, you don’t need to be on an economy tariff to make heating with electricity affordable. The unique selling point of storage heaters has always been their compatibility with economy tariffs. Electricity is usually more expensive per unit than gas, so for many years, the only way to keep costs on a par with those of gas central heating, was by exploiting economy tariffs that offered a reduced rate for overnight electricity usage in exchange for an inflated rate for daytime usage. Storage heaters were designed to charge up overnight, during low tariff periods, and release heat throughout the day without drawing power. This was an effective way to use the economy tariffs, but it did come with several disadvantages. Firstly, the heat was very difficult to control. The heaters would give off heat from the moment they began charging, keeping the house warm throughout the day but going cool in the later evening when the heaters ran out of charge. Secondly, the inflated daytime rate of economy 7 meant that any appliances used during the day – including computers, televisions, electric cookers and any additional heaters used to top up the temperature – would become very expensive to run. This problem has become all the more pressing with our modern, gadget-filled lifestyles. Unless you are at home in the day, go to bed early and have few electrical appliances, you will probably find storage heating wasteful, inconvenient and expensive. Luckily, the development of energy efficient electric heating solutions such as electric radiators and infrared panels has given homeowners everywhere another option. With precision thermostats, 24/7 digital programming and fast-acting heating elements, electric radiators are so efficient they can be used on an ordinary tariff and still work out cheaper than storage heaters on an economy tariff. With the freedom to switch on your radiators whenever you like, you will never go cold, whilst smart digital control will help you cut your energy usage down to a minimum. Because you can use them with an ordinary tariff, your other electric appliances will become much cheaper to run, decreasing your electricity bill overall. For most people, electric radiators, rather than storage heaters, offer the most efficient, convenient and affordable way to heat modern homes with electricity. Which electric heaters can be used in bathrooms? You could be forgiven for thinking that electricity and bathrooms don’t mix. But with the right level of protection, and professional hardwired installation from your electrician, there are many electric appliances which can be used safely in bathrooms. We do not as a rule recommend electric radiators or panel heaters for installation in bathrooms, because most models cannot be used to dry towels, and the temptation can be too much to resist when you have one fitted in your bathroom! However, infrared panels, quartz heaters and electric towel rails can all prove useful in a bathroom environment, provided you have them installed in a suitable location. All electric appliances carry an IP rating which indicates how much protection they offer against solid particles and water. The final digit of the IP rating indicates the appliance’s protection against water. For example, a towel rail with IP rating IP24 has a protection level of 4 against water, which means that the towel rail is protected against splashing water. This is the minimum level of protection required from your appliance if you want to fit it within reaching distance of a water source such as a bath or shower. Outside of this area – classified by electricians as Zone 1 & 2 – you are theoretically free to use whatever heating solution you like, but we would always advise choosing a heater of level 4 or above. This will keep you safe no matter how you use your bathroom. You can find a full guide to bathroom zones and IP ratings here. Our range includes towel rails, quartz heaters and infrared panels that are all suitable for bathrooms. Check individual product pages for more information, or give our expert sales team a call if you’re at all unsure. The term electric heaters encompasses a huge range of products, reflecting the unmatched versatility of electric power. From budget panel heaters that offer an economical heating solution for rooms you use less often, to premium infrared panels designed for energy efficient housewide heating with a stylish finish, the choice really is unlimited. If you like traditional electric heating solutions, a night storage heater might be for you. If you want to spend more time outside, perhaps a quartz patio heater would help extend your evenings in the garden. One of the great benefits of choosing an electric heater is the freedom to mix and match. Unlike gas central heating, you’re not committed to an integrated system of plumbed radiators. You can opt for a halogen heater in the garden, an infrared panel in the bathroom and an electric radiator in the bedroom: the choice is yours – there’s an electric heater for every occasion.